A key trigger for clients coming and speaking to us is that they recognise their website has reached a point that the look and feel of their site is outdated. This article discusses a number of examples that may point to the need for a redesign. Is your website visually outdated? The modern trend with website design is to allow your content space to breathe – the days of trying to include too much on a single page of a website are long gone. Even some recent examples of publishing websites we have designed which traditionally had articles and adverts appearing randomly all over a website page have understood the need to maintain a much more uncluttered look. This is somewhat linked to the previous point about a cluttered look and feel, but ‘above the fold’ is a term that is becoming less and less relevant in website design. Above the fold refers to anything that is immediately visible on a website and therefore doesn’t require scrolling. It used to be the case that as much as possible was above the fold as the theory was a visitor was most likely to action anything they saw straight away, but particularly with the advent of smart phones and scrolling becoming more and more familiar with website visitors, keeping everything above the fold is now becoming and outdated technique and actually leads to a cluttered look and feel which, as discussed earlier, is no longer a popular design trend. The days of a fixed width website are gone – internet users will access websites on such a myriad of screen sizes that if you don’t have a full width design that maximises the use of the space, you’re really missing a trick. A fixed width design often leads to a messy, cluttered appearance whereas a full width design gives your content room to breathe and is therefore much more aesthetically pleasing for a user. An optimal performance on mobile for a modern website is absolutely essential. 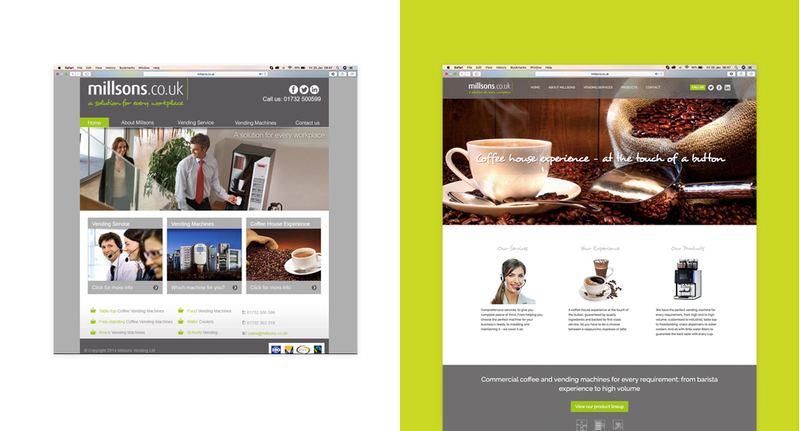 If your website doesn’t look great on a mobile device then it’s definitely time for a change. Every website we now design and build carefully considers the mobile performance, and it’s not just for users, Google much prefer a website that’s optimised for mobile. So if your website is either responsive and not up to scratch, or not responsive at all, that’s a clear sign of an outdated look. Modern design trends, for a good few years now have dictated that visual websites with large images are the way forward. Traditionally, many websites incorporated lots and lots and lots of text, partly because it was felt this was the best way to rank in search engines. Since then search engines have got more sophisticated with how they index websites, and website technology has become more sophisticated too, which has enabled designers to create a more minimalistic look and feel which is often pleasing to the user. Some text heavy websites still exist though, and there are clever ways such as expandable boxes which help retain a minimalistic look for sites with a lot of text, but if too much text is visible straight away on your website, it’s definitely time for a visual refresh. There’s more to a website than the look and feel, but investing in a quality design is important and with a website being the first port of call for anyone checking out a product or service, having an outdated website is not an option. Start planning for a new website sooner rather than later if you think your website falls into any of the above categories, and please get in touch if you would like to talk through ideas and options in more detail.